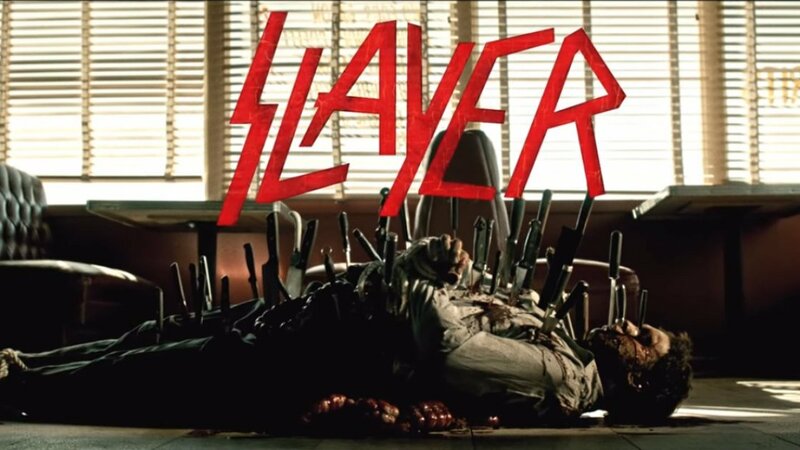 Metal legends Slayer have shared a gory music video for "You Against You," a track from their 2015 album, Repentless. Watch it above, via the band's YouTube. It's really cool being part of a video that's not just some crappy music video from the Eighties or Nineties... It's from a real Hollywood director who has a lot of friends in the biz who stepped up and wanted to be in a Slayer video. That's what makes it cool to me. Directed by BJ McDonnell, the action-packed 7 minute music video was shot in California's Mojave desert and acts as a prequel to 2015's music video for "Repentless." We see how the eyepatch-wearing prisoner in the first video wound up in jail. There's an intense amount of blood, violence, knives, and guns. Be advised, the clip is not for the squeamish at heart! Repentless is available on Amazon (Vinyl, CD). For Slayer's latest music, news, and tour dates, check out their Zumic artist page.